Many people buy a download and then burn it onto CD. Here you have an opportunity to create all the paper parts for your custom CD. All you need is a jewel case, a printer, a pencil and ruler, plus a guillotine, rotatrim or pair of scissors. 1. When you print these paper parts make sure your printer is set to print 'to actual size' not 'to fit'. 2. Before you start cutting up your paper parts draw lines through the crop marks with a pencil and ruler through to the edge of the paper, otherwise you will lose some of your crop marks as you cut. 3. 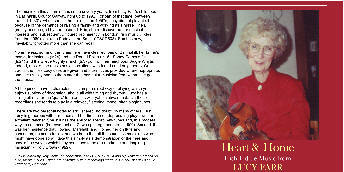 The label sheet has a label for both VT123DR 'Heart & Home' and VT125DR 'The Long Strand'. This is to save labels as you will only need one for each.